Written By Mr Cucknell, Outdoor Pursuits Co-ordinator…. My first experience of Ten Tors was last year as a volunteer. I had little concept of the time, dedication and hard work that the participants and team managers put in to prepare for the event and then continue to put in during the four days whilst in camp. On the Sunday when everyone finished I was left with an enormous sense of fulfillment and awe as all the Truro School teams came in exhausted beyond belief, both physically and emotionally. Therefore it was with great anticipation that I started planning this year’s Ten Tors training regime during the summer holidays . In November we began our training with our 2014/15 cohort . All in all we took part in eleven training weekends during the six months before the actual Challenge. The time and dedication the students have put in has been both humbling and inspiring. Few people realise the time commitment that is required to train and compete in Ten Tors. 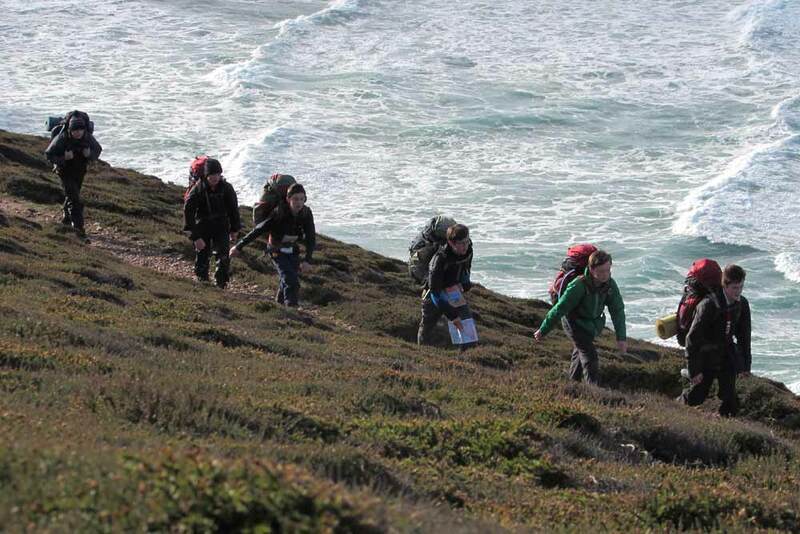 At Truro School our training begins in November where teams start to walk the Coastal path. The anticipation can be felt in the air as over 30 potential challengers turn up at the early hours of an autumnal morning at Mousehole and, with the sea mist slowly rising, don their day packs and start walking. Slowly over our first five training weekends we increase the distance and the weight carried as we make our way over more than 100km of the beautiful Cornish coastline developing our fitness and speed. Our first overnight walk with full camping and safety equipment is at the beautiful valley beach site of Polly Joke where many of the participants are introduced to camping for the first time. Ten Tors Coastal Training in February 2015. After Christmas we travel further afield for our training weekends and expose the challengers to the harsher environments of the moors. We begin by using Bodmin moor as a navigation exercise and utilising the school outdoor centre at Minions village before getting to Dartmoor later in the spring. We have four days to train on northern Dartmoor. By this time the participants are fit, fast and walking elite which leaves us only to train them in the finer details of moorland navigation and familiarisation with the wild camping experience that they will become accustomed to. At times I am sure that they think I am crazy as I insist that that meander around the featureless planes, valleys and tors on Dartmoor in a seemingly endless way. However, the more they get lost and find themselves metaphorically and physically the more that they learn about themselves and the challenges that they will face. The event this year was held from Friday 8 May to Sunday 10 May and consisted of 400 teams with over 2500 supporters. Mr Mannall kindly drove up very early on the Thursday morning to Okehampton Army base equipped only with a mallet, tent pegs and string and, in what can only be compared to the 1889 American ‘race for land’, attempted to find us our base camp. At 9am everyone is let loose and there is a mad rush to stake their claim for acreage. Mr Mannall managed to acquire prime property and quickly built up our village ready for our teams when they came up after school. Mrs Hatcher ran the base camp this weekend and provided all the 27 participants and numerous managers and helpers with all the tasty food and snacks throughout the weekend and I am indebted to her for her organisation and generosity. On Friday the teams have a full day of preparation for the event. They attend a safety briefing where they are explained the use of the satellite tracker that will be their lifeline should they get into trouble. They also undergo ‘scrutineering’ where the Dartmoor rescue team search all their bags and assess each article of equipment ensuring that it all meets with their stringent kit list and is of sufficient quality to withstand everything that Dartmoor can throw at the participants. In the past teams have been turned away for inappropriate whistles or sleeping bags without sufficient labelling so it is a credit to our teams that they flew through this procedure unhindered. 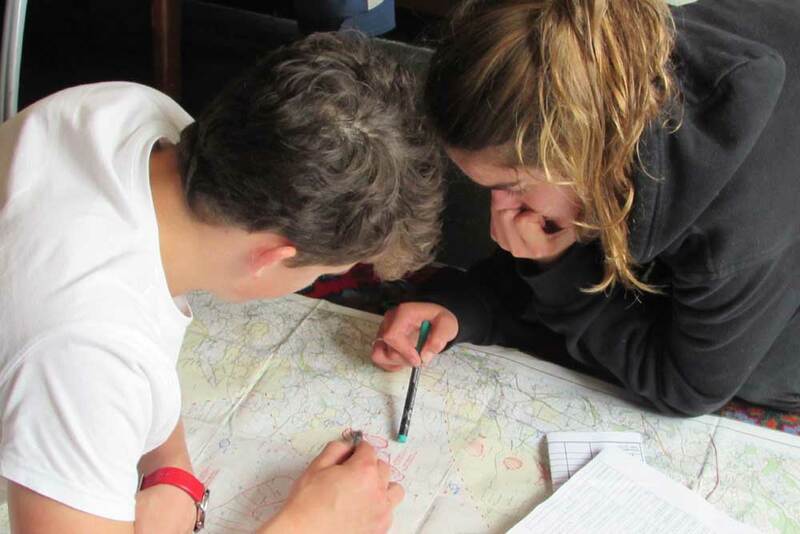 On the Friday afternoon each team sits down and diligently plans their routes through their Ten Tors complete with timings, river spate avoidance and potential camp sites. On Saturday morning the whole campsite is woken up, if they slept at all, over the speaker system with motivating music which unfortunately this year included rap. After any last minute preparations and a quick bacon butty 2500 people walk up the hill through a bottle neck to Antony Stile where helicopters are already buzzing overhead and the smell of aviation fuel is thick in the air. All 400 teams line up along the crescent crest of the hill in torrential rain eagerly awaiting the start. 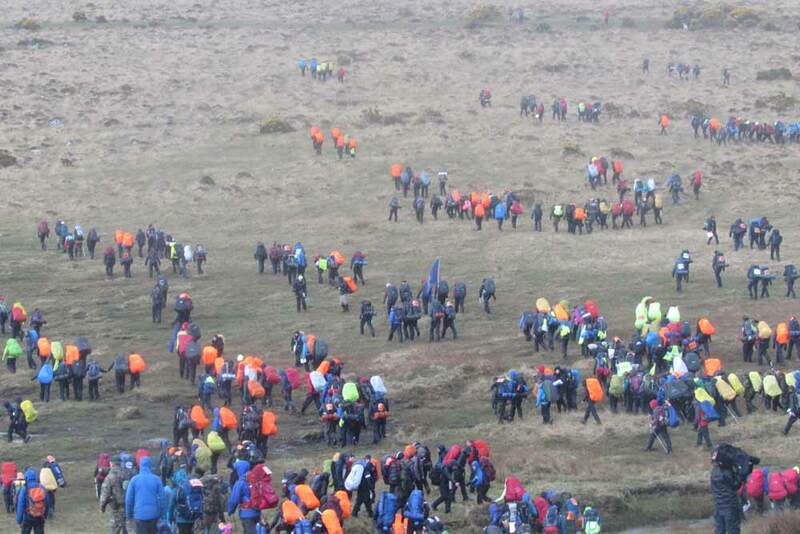 After the Chaplains’ Ten Tors prayer and a rousing speech from a General the cannons fire and over 2000 participants charge down the hill, trying to avoid falling in the ditches and rivers, whilst the helicopters manoeuvre just overhead. Even though this isn’t a propaganda stunt from the Army I am sure every young man witnessing this start would want to sign up if there was an enlisting station nearby. The teams are then on their own. I won’t lie to you….I have no idea what being on Ten Tors really feels like; I can however tell you waiting for the team trackers to identify their position… can tear your nerves apart. Once the teams are let loose upon the moor a nervous 36 hours awaits the followers. Even though I know we have trained them well and they are fully prepared for their challenge I cannot help but check the ‘wailing wall’ on almost hourly visits. This year we saw each of the four Truro School groups outstrip the competition (it is not a race!!) and camp at or near their expected campsites breaking the back of their routes and putting themselves in great positions for the Sunday. I knew that the participants get emotional when they finish but I had not expected that I would become so drawn into the emotion of the event. All I can say is how proud I was to see every participant walk across the finishing line on Sunday morning with their Truro School shirts on and huge exhausted smiles on their faces. We have had our up and downs over the six months of training and team building but to see all four groups finish in such good timing, and with everyone present, made all the early mornings and sleepless nights under canvas worthwhile. 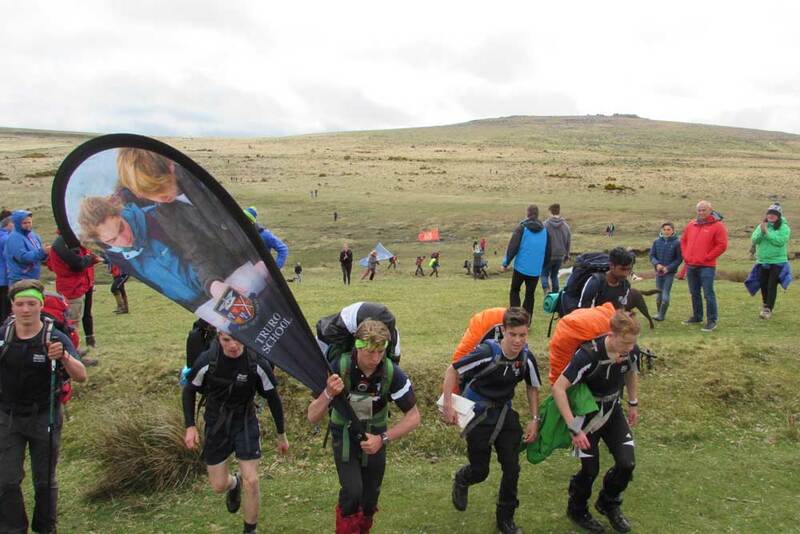 No one has ever been able to quantify the benefits of outdoor pursuits sufficiently but I can promise that not one of those thousands of people who were out at Okehampton Army base on Sunday morning for the finish of the Ten Tors 2015, needs numbers to know the effect that these activities have on the character building and development of young people. I have seen each one of those 27 youngsters grow and develop this year and I have an enormous amount of admiration for each and every one of them. It leaves me only to say a huge thank you to all the staff and parents who helped me to train and supervise the teams this year and without whom Ten Tors at Truro School would not exist. Mr Mannall, Mr Hatcher and Mr Morgan-Lundie have trained with me on almost every weekend and have shared those blustery nights and hours of waiting for teams in low visibility. Mrs Hatcher has been an absolute legend by running the base camp last weekend, organising all the team shirts and even accompanying us on many of the expeditions. Thank you to all those parents who came up to the event and helped cheer the teams across the lines and have seen the dedication and commitment required and I hope also the changes in their children. I am now off to start preparation for Ten Tors 2015/16 and I am already getting excited with the expectation on the year to come!